We all have so many dreams about life, career, and job, but with time there comes the need of livelihood. You cannot just leave your professional life to chase your dreams or start to do something with less earning just because you like it, you are going to face many challenges if you do that and eventually, you will have to give it up. It often happens that you came across a road where you have two career options, whether choosing a job or career no matter who you are: a fresh graduate, a professional or a business person. But have you ever thought about why you face such problems or what is the difference between a job and a career? There is a great confusion in people’s mind about job and career; even many of them think them as one and spend their whole life in misunderstanding. It is important to know the basic difference between a job and career so that you can understand what your needs are and what you want to do. 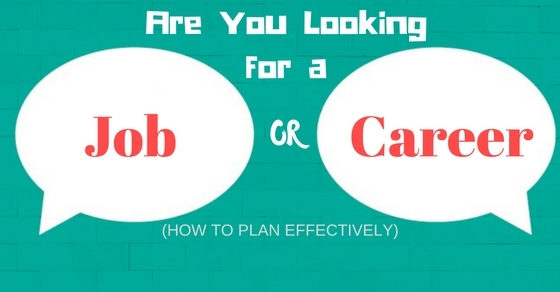 So what is the difference between a job and career? In this article, we are going to discuss what are you looking for in a job or career by explaining all the parts so that you can understand and decide. It is not easy to choose between two things which can make you or break you. The people who choose to follow what they want from the life and their career, get what they are working for. In this world to survive, we need food, shelter, and clothing and to earn these necessities of life we do a job. It doesn’t matter who you are, you can be the prince of England or prime minister of India but still, you will have to do something to earn the livelihood. We do all sorts of different work to earn that livelihood, but the main problem arises when your medium of livelihood becomes the reason for your unhappiness and stress. People often complain about their work career and how uninteresting it is to do on daily basis. If you sit for a minute and ask all these people why they are unhappy with their work they will say they do not like their job or career. People use the job and career interchangeably, as they do not understand the difference between job and career, but in reality, they are two different words with different meaning. The term career means working to achieve lifelong ambitions. Many people choose their job as their career path or make their ambitions the medium of livelihood but most of the people do not even understand the meaning of this two-term and spend their life wondering what is wrong with them or their job. So, it is important that you understood these two terms and know what you want. Now, as we have cleared the air about jobs and careers, you may be having a clearer picture of what you want. There is nothing wrong in a job unless you are unable to give your best attempt there because this is the job which helps you to pay your bills, rents and for food. People often complain about their job they have because their dreams are different from the reality of their life. Don’t you think you should be grateful for what you have and what you can still do in this global village where people are accepting diversity? Maybe you are too self-centred to appreciate what you have because there are people who want to be at your place and can work, may be better than you. Actually, the problem is people get confused with what they have and what they want, because what they have is the result of many decisions taken during the journey to reach here and the dreams are your ambitions, likes and what you want to be. Life is full of surprises and what you want now is different from what you wanted when you were graduated simply because experience taught us so many things and when we actually start working, our point of view and dreams change. When it comes to job versus career then you should know your job is the path that can lead you to your career. When you work hard, enjoy what you are doing professionally and wait anxiously for the promotion, then your job is the career you were looking for. Many people find their career path different from the jobs they are doing, but your jobs always play an important role in your career. So when you are trying to figure out what you want to be and what you are now, keep one thing in mind that it is your journey that helps you in finding your true career path, no matter how bumpy the road is because only after travelling through the road, you will find your calling. So there is nothing wrong in a job you are doing, just try to find what your calling is so that you can make it your career path. What are you looking for? This is a very important question you should ask yourself because it is always good to know what you are looking for before you start to work and earn. Money after the hard work looks good no matter how unattached you feel with your job, even we keep doing the work for the sake of paycheck we get at the end of each month. So do you know what you are looking for? Or are you just happy with the way things going in your life? There are people who spend their whole life doing a job; they never know what their career could be other than doing their job which pays for their livelihood. Here we are giving few points to make it easier for you to find out what you are looking for. 1. Do you like what you are doing? It is one of the important questions when it comes to a job or career. Ask yourself, do you like what you are now doing? If the answer is yes and you can do it for the rest of your working life or you can see yourself doing this after a few years then it is the possibility that you are on the right path of your career. People often spend time worrying about the dreams they have once in their life and forget to enjoy what they are doing. It is important to enjoy whatever you do because only then you can find your true calling. So think clearly before you make any hasty decisions about your careers and jobs, always appreciate what you have. 2. Do you feel satisfied with your job and a current working place? Satisfaction is the key ingredient of a peaceful mind. If you love what you do and you are satisfied with your work, job and place you are working on, then this is your career path. You don’t need a separate career path from your job, your jobs lead to your career when you find what you want to do till you retire from the professional work. People often get busy in figuring out the career path they want and forget what they are doing, which causes a big messy situation where you are stuck in a wrong place. So analyse your current working status. 3. Are you able to give your 100% to your work? When we love what we do, we give our best to our work. The mantra of having a successful career is to give your best no matter what you do, how you do and what is your profession. Hard work always gets paid even if the rewards are late, but hard work never goes waste. There are people who switch many jobs in their life, but there are at least few jobs where they love to work and give their best. This is your opportunity, your career which you are finding in your dreams you had when you were a child, college graduate. Reality has the habit of steering the direction of our life which brings changes and the changing perspective toward the things and life. So if you are able to give your best to your work and enjoy what you are doing, then go for it. 4. Do you enjoy the field you are now in? When we were young we all want to work in all the shiny and glamorous fields like doctor, engineer, astronauts, but hardly a quarter of the total population does what they dream in their teenage years. Most of us find ourselves on a different career path than what we imagine in our teenage self. The important question is do you enjoy the field you are now working in? If yes, then, whats the need of rushing for the dreams you saw in teenage years? Your teenage dream can still hold the power to make you change your path, but think it through, weigh all the pros and cons before you take the big decision because we human have tendencies to change with time. Are You Looking for a Job or Career? Now this is the most important question of this article, are you looking for a job or career? We had already explained what the meaning of job and career in detail and now, it is up to you what you want. People often let go many opportunities just because they are waiting for the one which leads them to their career but have you ever thought that the various opportunities you got, all the bumps you got while crossing the road actually are the learning you need to make a successful career. The answer to this question also depends on who you are, if you are a fresh graduate youngster who wants to try a different path then looking for the job is a more appropriate option but if you are experienced employee then you should look for a career. There are the live examples of people who got carried away with different jobs that come their way, but at the end, they find their calling, got their true job career path from the opportunities they got in their life. So embrace the opportunities that come your way and find your highest path by following what life throws in your path. Decide what you are looking for job or career and work according to it, so that you can meet your highest aspirations. In this article, we come across many things which play an important role in our professional life. People often ignore or overlook small details when they choose their career path or grab the opportunities to work. Your career plans after graduation can differ from the plans you have now after tasting the professional life and now you have a better understanding of what you are capable of and what is your aspect of your professional life. We hope this article can help you in deciding what is best for you. You can choose what you want and what exactly you are looking for. The global village is full of opportunities and waiting for you to grab it. Find the answer to this question and get set go, to live your dreams.